Indian veterans are honored by their families and tribes, before going on duty and returning home. The most visible expression for the honor of Indian veterans can be seen during pow wows. Women wear clothing with the names of the military personnel and their units, while veterans wear military uniforms decorated with beading, feathers or tribal symbols. There is nothing better than seeing veterans and servicemen open the dancer's foot in a pow wow by proudly wearing the American flag and the flag of their nation. When the Indians were placed in the reserves during the 19th century, the reason for the Pow Wow changed rapidly. They started using the dances to find spiritual help and a guide to change. For the government of the day, this represented a threat and prohibited them. The ban was lifted in 1933 and the dances became important in the tribal life. Today's pow wow is a vital part of preserving living cultures. 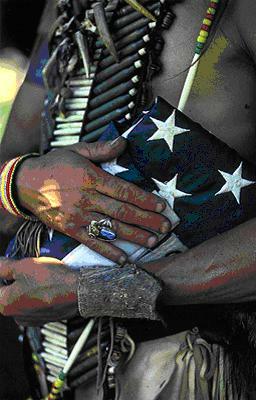 In many pow wows, veterans are honored. They are invited to open the dance, wearing the flag of the nation and the flag of the United States. One of his pow wow is specially performed each year in November to honor all the veterans of the United States. Less visible, but much more important are the rituals privately done for veterans.